The differences among myriad demographic groups also follow the usual socioeconomic patterns, according to the SSA researchers, Irena Dushi, Howard M. Iams, and Brad Trenkamp. Disadvantaged retirees typically don’t have pensions or large 401(k)s, and are, not surprisingly, the most dependent on Social Security: two in three poor- and low-income older Americans get 90 percent of their money from the program. 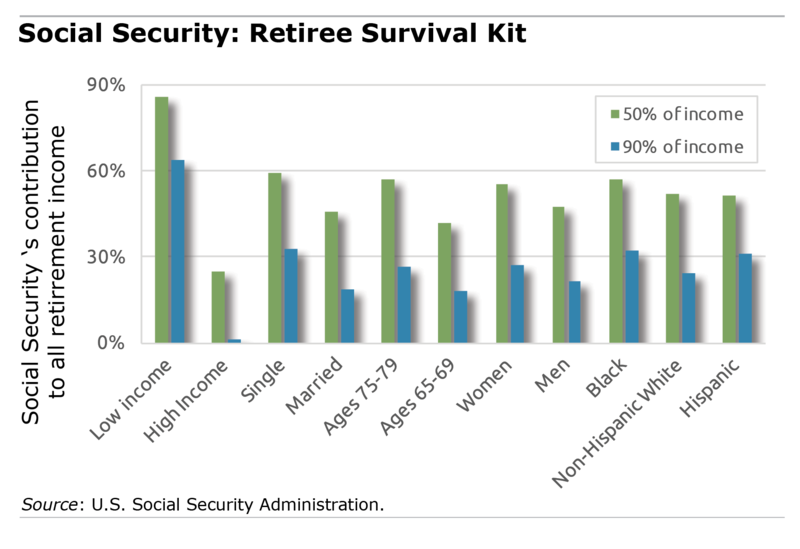 Women, many of them widows, rely on their benefits more than men; single retirees more than two-income couples; the oldest retirees more than the youngest ones; and blacks more than Hispanics and non-Hispanic whites. Measuring the program’s importance to Americans’ retirement security has become increasingly important amid a sea change in the U.S. retirement system from traditional, fixed employer pensions to employer-sponsored 401(k) plans. About half of all workers haven’t saved enough over their working lives. But various researchers have wrestled with whether they have accurate estimates of Social Security dependence, mainly because it’s hard to quantify how much income is coming in from relatively new 401(k)s. The key to the new estimates is the Health and Retirement Study of people over age 50, which measures 401(k) account balances in a “more systematic” way. The study, which was published last year, nevertheless confirms the basic conclusion of earlier ones: Social Security is critical to retirees’ survival. (1) That low income households rely more on Social Security is sort of by design inasmuch as it replaces a greater proportion of pre-retirement income. (2) If we delay Social Security – as we are repeatedly reminded that we should – we will necessarily become more dependent on Social Security. We’re retired, and Social Security provides ~20% of our income. After 70 (God willing) it will be at least half. That is not a cause for concern. Social Security benefits are tied to wages, therefore women who may have less time in the workforce due to child and eldercare, low-income people and minorities would depend on Social Security as more of their total source of income in retirement. None of this surprises me but makes me sad in that many people have little concept of folks who live solely on a Social Security check and how important Social Security is to their sole existence. And how receiving little COLA impacts their day-to-day life! Social Security should pay until the sum of all payments received equals the sum of all deductions paid in plus interest earned, after that it is just welfare, and should be based on needs. If that’s how it should work, then maybe you feel other insurance payouts should work the same way! Social Security is an insurance program. If it worked the way you say it should, it would be a savings program. Under the new tax law, why does a couple making $400,000. A year need a $2,000. Child tax credit for each child. Why nick the bones of those who are least able to care for themselves. The problem with the Social Security system isn’t that funds were borrowed from the trust fund. The problem was that in 1939 the Democrats decided it was more important to be popular and win re-election than it was to keep the system actuarially sound and so they changed it to a pay-as-you go system. The classic case being Ida May Fuller. I waited until 70 to collect my own Social Security benefit, while my husband took his at his FRA of 66. Although we are probably in the top 20% of income (including our Social Security), Social Security makes up over 50% of our total annual income because we optimized our claiming strategy. And the reason we have the other income is we saved diligently in our 401(k)’s and then annuitized a good portion to ensure that we would have sufficient income for the rest of our lives, however long that may be. I have read all the Center’s Working Papers and Briefs during the years of planning for our retirement, and I hope we have not made a mistake in depending to this extent on our Social Security and waiting to claim the benefits. The one unknown in our best laid plans for collecting Social Security is how long we will get to live. You will be fine, Merry, because one of you will benefit from the higher payout when you get spousal benefits upon the other’s demise. I think it’s best to opt for the higher payout and delay payments at least until FRA. Plan as though you will live to be 100 because the fact.is that you might.